Janna (Rothrock) is a psychologist who works as an expert witness in court trials. When her sister is killed by thugs, Janna wants revenge and finally realizes the only way to get real justice is to do it yourself. She also hits her head on a tree and becomes psychic. Happens all the time. Technically she develops her psychometry, which allows you a type of perception based on touching certain objects. Meanwhile, a romance develops between her and fellow Martial Arts practitioner and book publisher Nicholas (McKinney) - but evil chop shop boss Eugene (Scott) threatens everything. Is a cop named Briggs (Lo Bianco) doing everything he can on Janna’s behalf? Or will Janna have to take on the baddies all by herself? 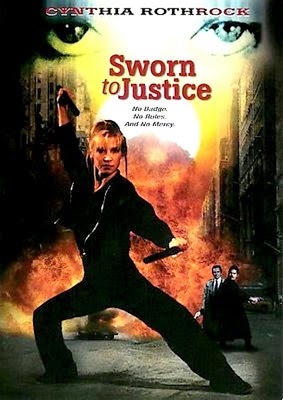 Sworn to Justice is typical 90’s Rothrock. But the cast assembled for this is truly impressive. Besides of course Cynthia herself, we have Kurt McKinney of No Retreat No Surrender (1986) fame in one of his only other action roles before he sank into the soap opera world. There’s also Walter Koenig as a fellow headshrinker, before he sank into the Star Trek world. Brad Dourif plays one of the baddies, in a brief role, and Mako is on hand as a blind newsagent that somehow knows it all. Kenn Scott, of Showdown (1993) fame is here and he has a run-in with Ian Jacklin at his garage. Eric Lee has a cameo as a storekeeper, Art Camacho is yet another baddie, and Vince Murdocco is here too. The mighty Max Thayer is on board as an attorney, and tying it all together is Tony Lo Biano as the cop, Briggs. To assemble a cast like this is pretty mind-boggling. But Sworn to Justice isn’t as epic as this might imply. While we liked the idea of a “psychic vigilante”, and the fact that this is one of Cynthia’s more glamorous and feminine roles goes a long way as well, there are some weird tone shifts in the movie. One minute there’s a comedic brawl with wacky sound effects like “BOIIIING!” and elephant blarings (all for no reason that we can discern), and the next minute Janna is crying over her dead sister. But the fight scenes are what we’re all here to see, and there are some good ones. The fight in the garage was a movie highlight, and is even reminiscent of the one from Misson of Justice (1992), which was a standout scene in that film as well. There is another Wincott/Mission of Justice parallel in addition to that one, because Cynthia uses Arnis sticks to fight baddies, just as Wincott does in that movie. There are some classic 90’s-style tunes on the soundtrack by bands with names like Buddah Heads and Addict Sunday. It’s good that they didn’t blow their budget on the hot hits of the day, like The Taking of Beverly Hills (1991) foolishly did. Of course there is the time-honored sax on the soundtrack as well. While Rothrock fans will certainly want to see Sworn to Justice, it might be worth watching in general, simply for the cast they managed to assemble. I had no idea McKinney and Rothrock were in a movie together, let alone with Chekov from Star Trek. I like Rothrock's work a lot. Her acting will never win an Oscar, but I think her DTV work was always solid. I haven't seen too many Rothtock films (I really hope she makes an appearance in the female Expendabelles), but Undefeatable is a long-time fav of mine. We love Undefeatable too. That is a classic. If you want to watch more Rothrock, we recommend Honor and Glory, Above The Law (1986), and Guardian Angel.